Quincy R. Lehr was born in Oklahoma City in 1975 and lives in Brooklyn, where he teaches history. His poetry and criticism have appeared in numerous venues in North America, Europe, and Australia. He is the author of Across the Grid of Streets (2008), Obscure Classics of English Progressive Rock (2012), and Shadows and Gifts (2013) and is the associate editor of The Raintown Review. "No poet since T. S. Eliot has been able to fuse a panoramic vision of history, a bead on popular culture, a biting satirical intelligence, and a soaring lyrical gift like Quincy R. Lehr. Heimat is Lehr's Waste Land, updated to the present moment where "The modern's 'post-.' The culture's 'multi-' now, / capitalism's shaky, and it's 'late.' / The cast, though, stays on stage, the final bow / has yet to come for this, the nation-state." The sheer scope of this work leaves the rest of us contemporary poets in the red-dirt dust of Lehr's native Oklahoma." 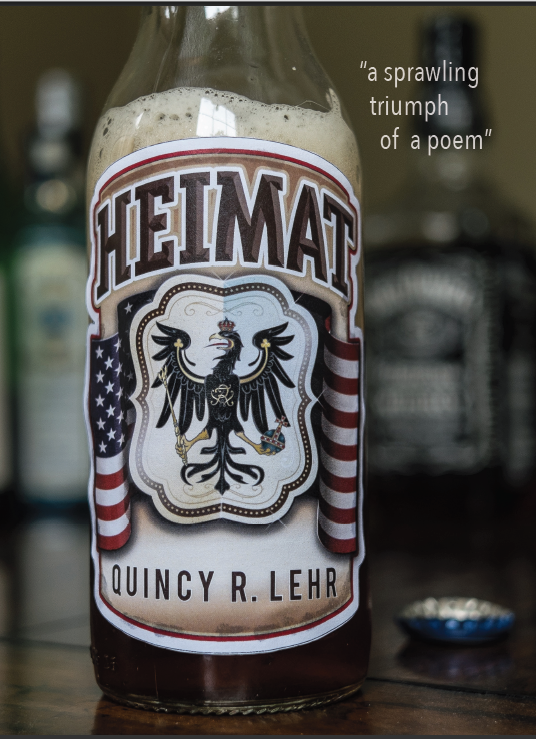 "Quincy Lehr's Heimat is a sprawling triumph of a poem. In a time when the uptight one-page lyric has achieved something approaching full-spectrum dominance, Lehr challenges contemporary poetic fashions in a most fundamental way. Heimat is a political poem of rare intelligence, daring, and formal rigor. Like The Wasteland, it wanders history and the world—from Battery Park to Dingle in the Kerry Gaeltacht—in search of truths. It is the poem T.S. Eliot might have written if he'd been a disappointed Trotskyist from Oklahoma." Release date: June 16 2014.